Home > News List > Update Batch #21 - Kharidian Desert! Aug-06-2018 - Update Batch #21 - Kharidian Desert! It has been long overdue, but we are finally back with another update! We hope that you are all as excited as we are and find it well worth the wait. We bring you Update Batch #21. The Kharidian Desert is an expansive region located south of the nations of Misthalin and Morytania. The desert becomes a dangerous region south of the Shantay Pass, requiring a player to drink from waterskins or other sources of water to avoid dehydration. You will automatically drink every 90 seconds if you have a waterskin with charges in your inventory, the time between drinks can be extended by wearing Heat-resistant gear. Failing to drink will cause the player to periodically lose hitpoints. Within the boundaries of towns, players are immune to desert heat and do not need to drink. Ali Morrisane - RuneScape's self proclaimed 'greatest merchant' - is having difficulties. He is selling things at such a rate that he cannot keep his market stall in stock. Word has it that he is on the lookout for someone; someone who can recruit some help from his home town Pollnivneach - a somewhat anarchic place, south of the Shantay pass. Talk to Ali Morrisane in Al Kharid (He is located just southwest of the Duel Arena teleport). He will ask you a favour. He needs you to go and find his nephew, 'Ali' who lives in a small town southeast of Al Kharid called Pollnivneach. Buy the Kharidian headpiece and a fake beard from Ali Morrisane for the disguise to be used later. You can combine the Kharidian headpiece and the fake beard right away to create a Desert disguise (which is used later on during the quest) to save inventory space. Also, don't forget your waterskins and desert robes. South of Al Kharid a new desert pass has opened up, leading to the dangers of the Kharid desert. Don your desert garb and make sure your waterskin is full before heading off into the trackless dunes in search of desert adventure. Talk to Irena just outside the Shantay Pass. Ask her about her daughter until you offer to find her. After starting, unequip all of your metal armour, and put on your desert robes. Since you're in the hot part of the desert, your character will grow thirsty and take a drink of water as time passes. 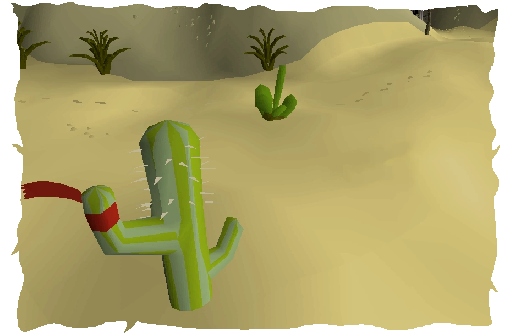 Desert robes will make your water last longer, and you can refill your waterskins by cutting cacti found around the desert with a knife or a slash weapon. The Agility Pyramid is a dangerous Agility training area located between Sophanem and Nardah. It is also known as the Jaleustrophos Pyramid. Here, players must climb to the top of the pyramid, retrieve a Pyramid top artefact, and drop down to the bottom to hand it to Simon Templeton in exchange for 1,000 gold pieces. Players must enter the doorway at the top of the pyramid, or the pyramid top will not be replaced. The Kalphite Queen (Kalphiscarabeinae pasha), also called the KQ, is the strongest of the Kalphites. The Kalphite Queen, along with dust devils and smoke devils, is notable for dropping the Dragon chainbody armour. 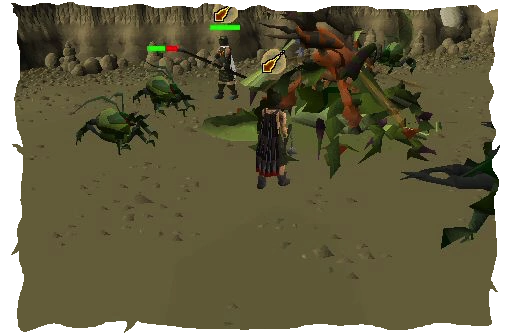 The Kalphite Queen is one of the toughest monsters in ScapeRune. She can inflict large amounts of damage with her Ranged and Magic attacks as they always result in a successful hit. It is recommended for players to bring an emergency teleport such as an Ectophial or teleport tablet, or only bring items into the lair they are willing to lose. • Pest Control logout patched. • Pest Control time patched. • Thieving success offsets changed to further replicate the real game. • Farming disease rates further replicate real game. • You can now use the gnome glider during the Grand Tree quest. • Magic longbow special attack patched. • Maze random event reward patched. • Giant mole now has proper dig mechanics and sounds. • You can now empty compost and super-compost. • Jail guards now drop bones. • Vegetable sacks will no longer give a nulled item. • Grand tree gate patched. • Trading now results in the phrase 'Sending trade offer'. 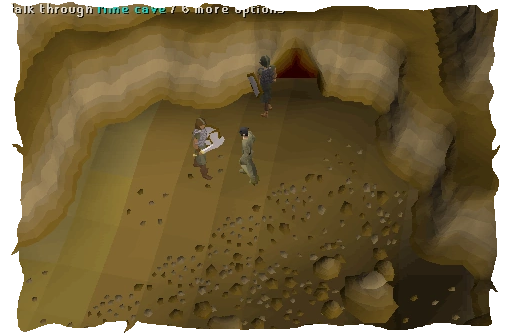 • Amulet of glory will now allow teleportation below 30 wilderness. • Balloon animals will now always move. 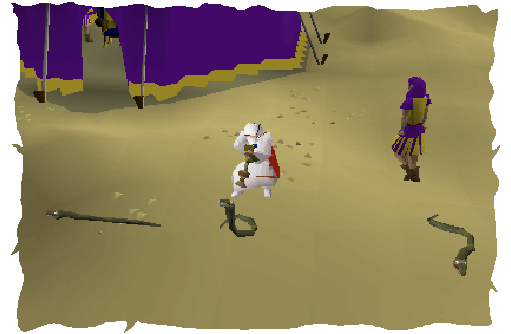 • Prayer will no longer drain within random events that teleport the player away. • You may now read the barcrawl card. • Rock crab's seaweed drops are no longer noted. • Patch regarding the Dharok's armour set. • Fixed logging in during an Agility movement. • Fixed nulling when dying with barrows items. • Patch regarding Fishing Trawler. • Weighted Random Events (You will now get ones related to your skill more often). • Patched safespoting certain Demons with melee due to their size. • Possibly patched the issue regarding 'You are already in combat' when fleeing and attacking an NPC quickly. • Patched the Duel Arena death sequence (where there was a possibility of a player going to Lumbridge on death if both players die at same tick). • Patched the parsing sequence for dropping on startup. • Added a fail-safe for teleporting with Ana in the desert. • Patched sounds for trap doors, drawers, doors, and bookcases. • Converted ground items to the new parsing system. • Patched Priest in Peril (previously it was impossible to use the water on the vampire if you went in a certain order). • Added Irena going invisible and switching stages to the happy one after finishing Tourist Trap. • Added XP Completion for Barbarian Agility Course. • Fixed teleporting by making it lock interfaces. • Rework regarding our locking system and interfaces. • Fixed the component locking for the Prayer's tab. • Patched opening the equipment interface (it will now close the chatbox interface if one is active). • Small rework of the interface system. • Random events will now check further to make sure you are able to receive one while doing an action. • Small Fight pits patch. • Patched monkey bars near earth warriors. • Began development on a more efficient parsing system for our database. • Limestone is now mine-able. • You can now smith Blurite. • You can now farm Bittercap Mushrooms. • You can now farm Cactus. • Imp catcher cut scene no longer glitches out and goes off screen. • Bronze smithing now displays the correct level requirements. • You can now fletch arrows/bolts/darts in sets less than 10 or 15. • You can now break coconuts. • You can now create coconut milk from broken coconuts. • Players will no longer get stuck on demon slayer when getting the muddy key. • You can now make dough with jugs of water and bowls of water. • Woodcutting now has a decay chance of 1:8. • Leveling up now cancels your action unless in combat. • Avan now says goldsmith gauntlets instead of cooking gauntlets. • You can no longer fletch arrows/bolts/darts with a full inventory. • Granite is now mine-able. • You may now interact with items while stunned. • Interaction now runs smoother and interacts instantly when reaching the destination instead of having a 1 tick delay. • Overhauled the pathfinder that large NPCs use to replicate the real game. • Synchronization for Clan Chat. • Magic and Range combat distances are now accurate to the real game.